Need to flush your system fast? Quick-Detox can rid your body of all traces of toxins in as little as two hours! Made from all natural pharmaceutical grade botanicals, Quick-Detox is more than twice as effective as many other leading brands, has a 99.92% success rate, and is completely undetectable! It seems everywhere you turn these days someone is trying to place limits on your personal freedom. We've all heard stories of friends and coworkers losing their jobs over unfair and wildly inaccurate drug tests. Many times employees are wrongly accused of using illegal narcotics due to 'false positive' drug test results which can be brought on by substances as common as over-the-counter cold and allergy medications. Thanks to the ingenuity of our laboratories' staff of chemists, you no longer need to worry about your private activities jeopardizing your professional career. Unlike most detoxification products, which must be used weeks in advance of testing, Quick-Detox completely flushes your system of all traces of contaminants in as little as two hours! Our laboratories takes great care in ensuring that all of our products are made from only the finest ingredients available. Unlike 90% of the cleansing products on the market, Quick-Detox contains absolutely no fillers, lubricants or additives which can be easily detected with modern drug tests. 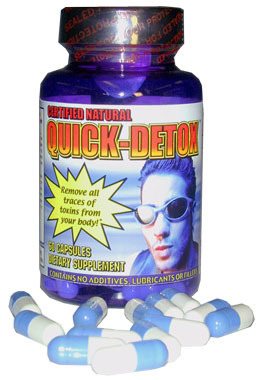 Quick-Detox contains 100% of the FDA's recommended daily intake for 12 vitamins and 4 essential minerals. As the flushing process can rid your body of certain nutrients, it is essential to replenish them. Low levels of certain vitamins and minerals often raise the suspicions of the testing personnel. Please Note: Consumers should be wary of purchasing any urine cleansing product that does not offer a legitimate money back guarantee. We are so confident you will be pleased with the results that we offer a complete satisfaction, money back guarantee! Sure, Certified Natural Quick-Detox may cost a little more than other brands, but isn't it worth it? Quick-Detox™ is not intended to diagnose, treat, cure or prevent any disease. © Copyright by Health Image & Companies.